It was time for me to decide between Yamaha R15 and Bajaj Pulsar 220 in the month of January 2010, because I needed a very big change in my life and the biggest is changing my bike because I am so much passionate and my bike is a part of my life. I am Deepak, 23. I was working for a BPO in Hyderabad. I was born and brought up in Visakhapatnam. 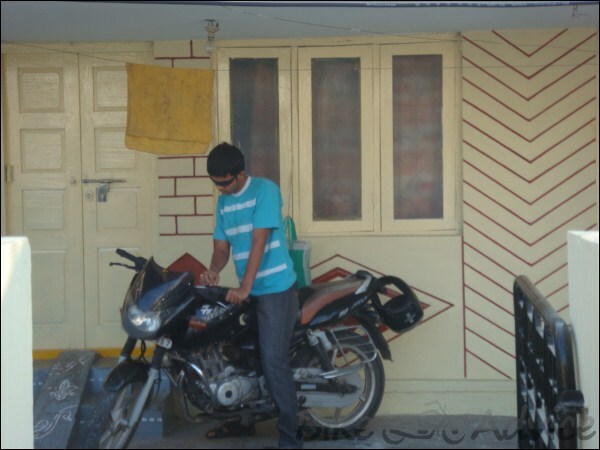 My first bike is Bajaj Pulsar 150 DTSI which my dad bought for me when I was in degree second year. I hate riding others vehicles because I am always in fear of accidents and I never thought of myself in that fear but, I always thought of the sentiments and feeling attached to the bike by its owner as I do. I learnt riding vehicles on my own except car as my parents are in fear of accidents that we all see daily. My first vehicle was Bajaj Chetak scooter, and I was in 8th Standard(year Y2k). Right from my cycling days in 7th standard (year 99) I am very much passionate about 2 wheelers. Out of my passion I started learning scooter which is available in my grandmother’s house. My mother’s brother was using it. Every weekend my family used to go to my grandmother’s house and I used to push the scooter up the road and then I sit on it and learned balancing it all the down. I did this for almost every Sunday till 3 months. I promised my parents that I do not start the engine but once I succeeded in convincing them to switch on the engine after practicing to balance the vehicle well. This is the day which I can never forget in my life. As usual I pushed the scooter up the road and sat on it. I know that I don’t have enough strength to start the engine by using its kick start but I am talented enough to start the engine by shifting up the gear and releasing the clutch when its well balanced while traveling down the road. I had enough of visual experience of this procedure but that was the first day when I implemented. My experience can not be put in words but let me give it a try. First time when I decided to start the engine I was in fear so I did tried to start at all second time also I had a fear so I thought so many times and then I decided to shift up the gear and release the clutch and I did, but unfortunately it was already too late so the scooter stopped instead of starting the engine. And finally I realized that I am over cautious because all my relatives are watching me. So I asked everyone to resume to their work and I tried again. Friends this time I succeeded but when I accelerated it started I thought that was the last time I saw my parents. I felt as if I am dying. My breath stopped for a while. I felt my heart was slowly following me and I am traveling too fast for it to reach me. Because it is traveling in 20kmph and 25kmph for accelerating it once in second gear. Immediately I applied breaks and stopped it so that my heart reaches me before my breath stops forever, but forgot to apply clutch so engine is off again. I was lost for a minute and then felt happy and was very eager to tell everyone that I started the engine by my own. This feeling is really inexpressible or more than what I expressed. Later practiced it well but always had the fear of over accelerating it. That’s the day when I realized two wheels with an engine travels effortless when compared to the same two wheels with out an engine and yes I am talking about the difference between a scooter and a cycle. As years passed by I grew up and moved to higher and higher classes but I did not improve my skills in riding scooter because its not well maintained and parents advised me to postpone my idea of improving my skills. When I was in 10th standard my dad bought a Hercules cycle for me. By now you all must have understood that I am very much passionate in riding a 2 wheeler. I used to ride my cycle for 20kms on beach road, everyday at 5 am during summer holidays and Sundays are very special to me because only on Sundays I get a change to ride 10km to my grandmother’s house and 10km back home apart from the early morning ride of 20kms on beach roads. So almost all Sundays I had a chance of riding my cycle for 40 kilometers. As I grew up my passion for 2 wheelers also increased. Because I had no experience in bike riding I decided to go for seconds. My first bike Bajaj Pulsar 150 DTSI 2004 model. Its was gifted by my dad. I had no experience in riding a bike but still I went for one of the heaviest bikes in 2005. Just like my days when I learnt on chetak I started learning Pulsar but this time I had less fear and soon after taking it into traffic all my fear just vanished. I thought I got something to satisfy my passion and so I did. I am the one who always participated and encouraged all my friends for long trips on bikes. Before going for Pulsar I heard a lot about the increased accidents in my city and poor Pulsar is one of the reason for most of the accidents in fact it’s the only reason for accidents. Then I started enquiring about the reason for accidents. Most of my friends said all that’s because of the front disc break. 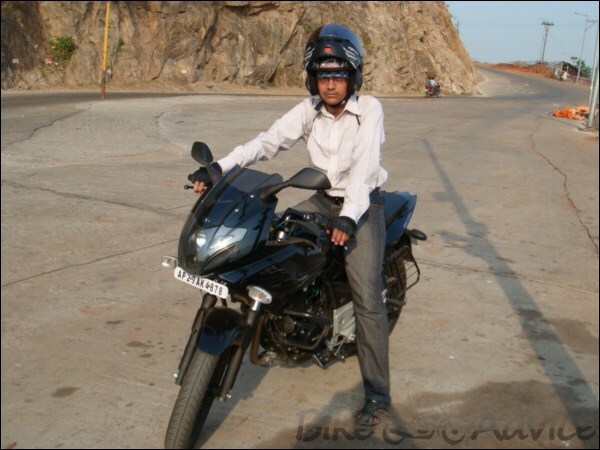 One of my friends riding Pulsar 150 asked me if I am very much passionate in bikes and if I ride safely or not. My answer till date did not change and the answer is safety first no matter what happens. So he suggested to go for Pulsar to satisfy my passion. And so I did. 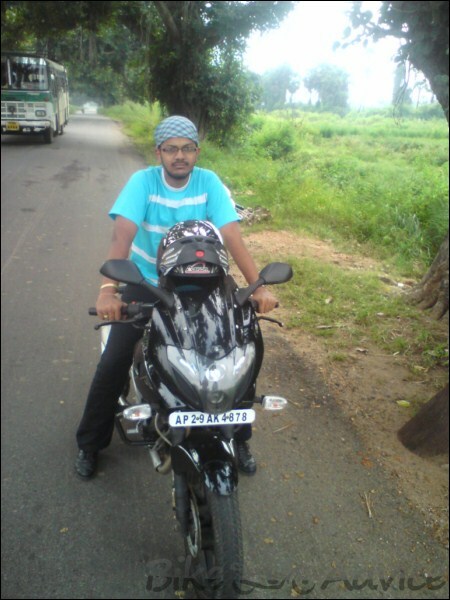 I had enough of memories with my bike I traveled to Araku valley which is 110km away from Visakhapatnam. I love to ride my bike on the mountain roads or curvy roads. And the longest distance traveled on my 150 cc bike is 160 kilometers way to Kakinada and back to Visakhapatnam totaling to 320 kilometers with my mom in single day. Hats off to my mom. She is worried of me and so she joins for a ride with me. One sad morning most of those memories erased just like that and started making me depress day by day because people whom I liked the most left me with their memories with me and my bike and they were busy looking out for their own life. I am still struggling to come out of this situation as a part I decided to have major changes in my life so that my thoughts keep changing. My bike kept me away from tears and pains: Because I love riding I always have my complete concentration on road and traffic so I forget every problem of mine when I am riding. I always ride happily. And finally thr time has arrived for me to decide between Yamaha R15 and Bajaj Pulsar 220 in the month of January 2010, because I need a very big change in my life and the biggest possible for me is changing my bike. I saved 50K and I thought of going for finance but fortunately as my brother decided to gift me a bike because I am very much interested in bikes. (Thanks for your patience in reading my lengthy review but still I am yet to go about my Pulsar 220 DTSI.) Which bike should I go for: I like riding a lot so for me top speed and pick up matters a lot. So Pulsar 220 is the only one came to my mind but R15 also a good one I was confused to choose between these two. later while I was browsing the internet I realized that pulsar is worth for 80k and R15 is over priced. I browsed internet and read magazine which made me know most of its features. Handling was good for pulsar 150 which I used and in one of the magazine’s I read that Bajaj improved its bike’s handling by the help of KTM technologies. And that’s true. It has 220 cc engine. Improved handling with the help of KTM bike Technology. 2 to check engine oil, 3 engine temperature if overheat, 4 blinkers automatic turn off just like cars do, 5 checks the battery, 6 checks if Oil cooler is working or not, 7 Automatic choke when required. All the above support very good for a bike with 21BHP and 19 NM. 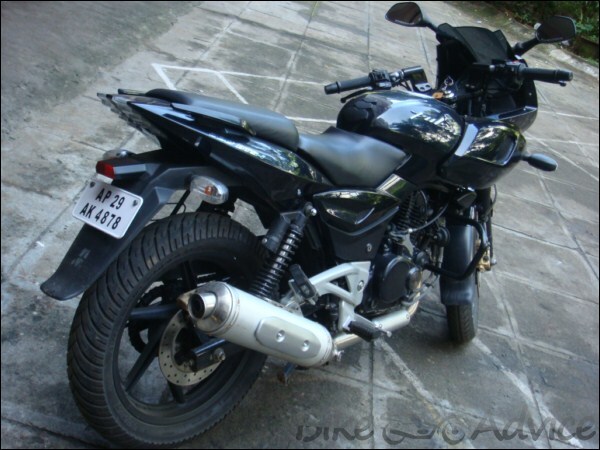 I was using its ancestor and I know that Pulsar 150 2004 model has no problems so I decided to go for Bajaj Pulsar 220. Same feeling when I first learnt chetak (already mentioned above) I felt as if my heart is slowly following me and going tooooo fast. After riding it rear disk breaks fit for nothing is what I thought but I realized that I took 1 month to understand how to apply breaks to stop it when required. Rear break helps you controlling your bike and front break stops your bike. This is awesome when you travel at high speed. Possible to stop the vehicle with out getting the tires locked. Main stand is too low and hit’s the ground every now and then. U-turn is literally not possible in narrow roads. I named my bike as Mini car in case of U-turn. Top speed and pickup is simply superb. I traveled at 133kmph with a pillion rider of 80kgs and myself 75kgs. Its is an un-forgetful ride when I raced with Maruti Swift and touched 133kmph. Twice I met with accident: Once on my first bike while learning; I failed to carry its weight in corner and second one on my new bike. I was totally disturbed so went for a drive and took a bad hit on my face. A new learner with a driving school car took a sudden left without any signal from extreme right resulted to take a big hit on my face. 3 stitches above my eyebrow and 2 on my chin. Whatever happens my bike really keeps me away from tears. Happy for my passion on biking. Though I was wounded badly but I did not feel any pain because I was already struggling with bigger pain and thinking about it which was hurting me badly. It took 15 days to recover completely. I love long rides and so I did many till now. My longest ride on my new Pulsar 220 DTSI is Hyderabad to Visakhapatnam 700kilometers in 9 and 1/2 hours of traveling time. Much faster than a Volvo bus. A snap at Vijayawada is shown below. 400kilometers non-stop from Vijayawada to Visakhapatnam and no change is observed in bike behavior. Recently I traveled 106 km to have my lunch and 106 back home for dinner. If my mood is off I go for a ride and fix it. Every now and then I go for a long trip and two planned as of now one is 160 km one way to Kakinada for a week days trip and other is mentioned below. ODO meter reading 7800Kms done so far. This is how my bike kept me and keeps me away from pain when in problems and still it does the same for me. I planned to start my career as a racer but I had to stop thinking on those lines as my parents asked me not to do that. How ever I am planning to go for a bike tour for couple of days in Andhra Pradesh still need to convince my parents. While righting this I took a chance to convince my mom first and she accepted but after 5 years and that too with my wife.